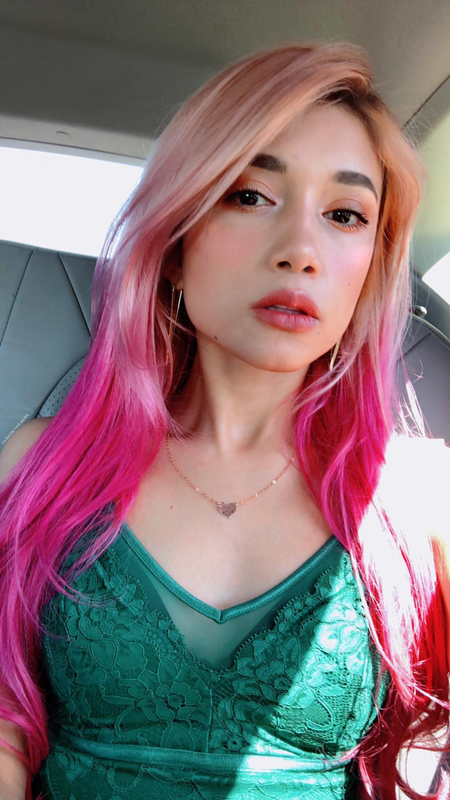 Graduation Green Lace Dress | Fashion Fab News - fashion, beauty, celebrities, designers . I’M WEARING: Dress: Jojo Lace Cami Dress - Guess / Similar from BeBe | Sandals: Moo Shoes | Earrings: Aldo. Looking for the perfect dress for my brother's graduation was such a hassle. It started when I bought a lace dress online two months before the big day. When I finally received the dress... what a surprise! the fabric wasn't what I was expecting. 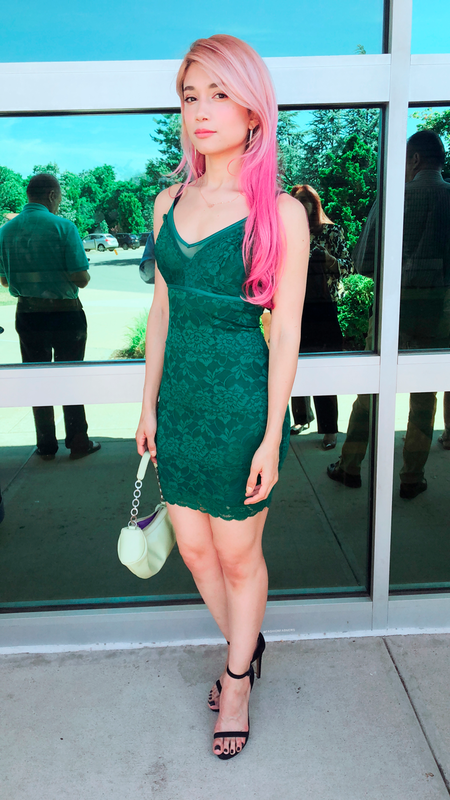 It made the dress to look low quality and not something I would like to wear for a graduation. I couldn't believe that this expensive dress from a well-known brand looked so bad. Of course, I returned it and I'm not planning on getting anything from them anytime soon. I kept looking everywhere for the perfect lace dress and I couldn't find it for weeks. My brother's graduation was gonna be in less than a week and I didn't have a dress. I was gonna wear a jumpsuit that I purchase before and needed some alterations. I decided I wanted to fix my black jumpsuit, adjust it to my body and wear it to the graduation. I couldn't convince my mother that I didn't need a new dress. She made me go to Macy's and try to find the lace dress that we both wanted from the beginning. Hard to say NO to your mother, Am I right? I went to Macy's and tried different dresses. I was lucky that day; every dress was beautiful and fit perfectly. 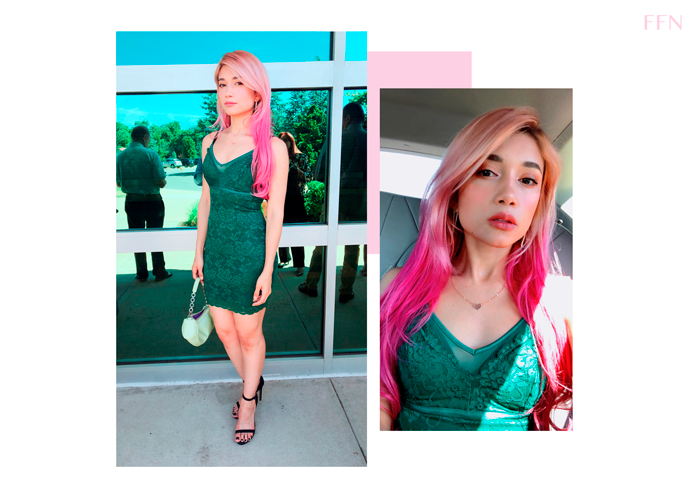 I found this green bodycon dress from Guess and I knew immediately that it was the best option. I prefer A-line dresses, but this one for some reason seems like a great option for a graduation in Summer and it can also be worn for other occasions. Nowadays, I don't buy clothes just for the sake of buying clothes, I think thoroughly before purchasing my next clothing piece. Do you like lace dresses? I do. Don't forget to follow FASHION FAB NEWS and LINA MAYORGA (my fashion brand on social media. Eyemakeup: Nubian Eyeshadow Palette - Juvia's Place.